Words cannot even begin to describe how amazing this suit is! Upon receiving my first I immediately gathered the funds to purchase another. I am now ready to purchase 2 more! The fit is above and beyond all expectations as I have never had any one garment fit so dead on, and that's an understatement. This suit has now become a regular garment in my everyday wardrobe which is only going to lead me to acquiring several more in a variety of colors. 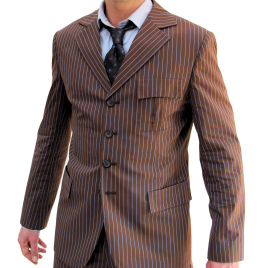 This suit is perfect for any Doctor Who fan as the style lends to the original wonderfully! This style both satisfies my fan-ship in regards to David Tennant's Doctor as well as my affinity for a Mod 60's British Slim Suit Style. Another prominent detail is the fact that I have gotten nothing but compliments on both of the suits which have lead to many recommendations to Magnoli Clothiers. Overall, Magnoli has a lifetime customer from here on out, no question. Purchase this "brilliant" suit with the utmost confidence as you will in no way be disappointed!